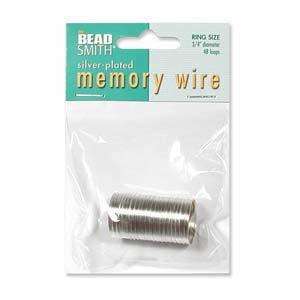 Use Plated Steel Memory Wire to create rings, bracelets, necklaces, anklets, and wine glass charms. Use Seed Beads, double-drilled beads, and spacers to create interesting combinations and patterns. Finish off wire design ends with Memory Wire End Caps or make a loop using round nose pliers. We recommend using Memory Wire Cutters to cut memory wire as it will damage the blades of standard cutters very quickly.